Few living anime studio executives can boast a story as remarkable as that of Hiroyuki Yamaga. While a student at Osaka University of Arts, he brought together Hideaki Anno, Takami Akai, and a number of other talented young creators to produce two opening animations for science fiction convention Daicon, laying the groundwork for what would become Studio Gainax. At Gainax, Yamaga directed its debut work, the ambitious science fiction anime film Royal Space Force: Wings of Honneamise at the age of 24, and presided over the production of smash-hit series like Neon Genesis Evangelion and Tengen Toppa Gurren Lagann . Recently, however, Gainax has hit a few snags. The studio had a bit of a brain drain, with major creators like Evangelion 's Anno and Gurren Lagann 's Hiroyuki Imaishi leaving to form their own studios (Khara and Trigger, respectively). On top of that are the financial issues, including a lawsuit filed by Anno's Studio Khara regarding unpaid royalties that Gainax settled a few weeks after this interview was conducted. Despite all this, in his annual appearances at FanimeCon in San Jose, CA, Yamaga has been assuring longtime Gainax admirers that the studio is still hard at work on new projects, including a long-percolating sequel to Royal Space Force titled Uru in Blue ( Aoki Uru ). I sat down for a few minutes with Yamaga to discuss some of these projects, and to look back at the incredible yet troubled legacy of Studio Gainax. 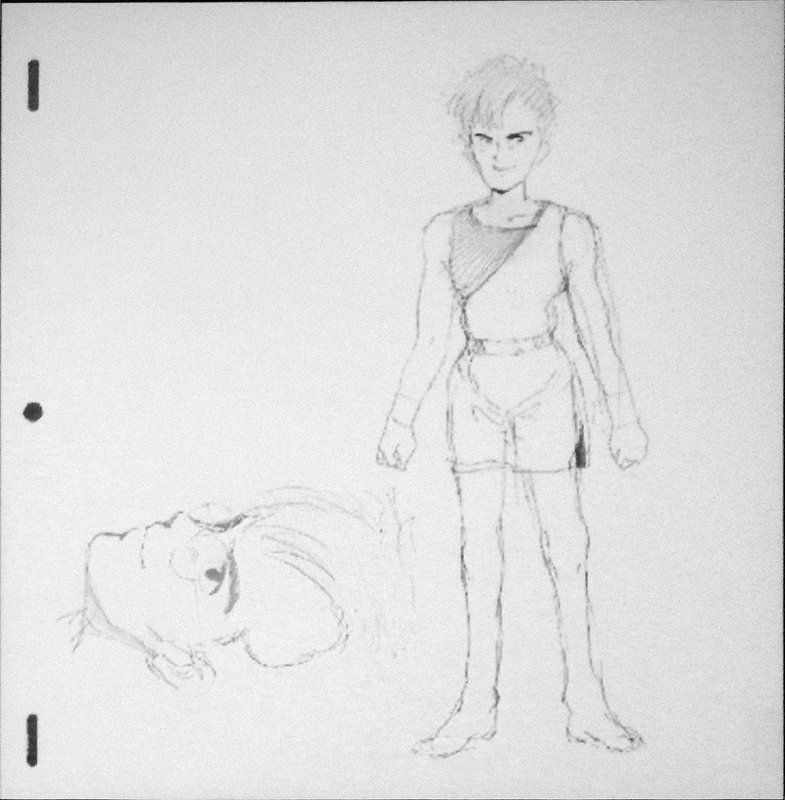 An early character design for Uru in Blue , shown at Yamaga's panel at FanimeCon 2017. Before, gathering the funds for Uru in Blue was simple. We were just gathering the funds for the initial production. But now we are gathering the funds for the entire production, not just pre-production. So the only way to get this moving, since none of us are rich enough to be able to afford making it, is to start going for things that don't cost anything, like writing the script and designing the characters. So in June that's what we'll be starting to do. What about the free-diving anime series, Akubi o Suru ni wa Wake ga Aru ( There Is a Reason That We Yawn )? Actually we can’t make a living with Uru in Blue so there are several productions going on in the background and one of them is that. I can't say much. There are still others being made at this moment. In July, during Japan Expo, I will announce one. I couldn't say it out loud per se, but for the project I'm announcing at Japan Expo, the script's already made. It's an out-of-the-blue kind of work so I myself am like "I'm making this?" So you'll be surprised. I also wanted to ask about Gunbuster 3 . It's still in the planning phase. We're still trying to get funding for it. A young Hiroyuki Yamaga is a main character in the Japanese TV drama Blue Fire ( Aoi Honoo , a.k.a. Blue Blazes )! How accurate are the events of that series? Well it started as a manga. I was reading the first few chapters and said, "wait, this wasn't how it went." So I called the artist up and said, "It didn’t happen that way. This is how it went." And from then on I started giving him the details of it. From there the TV drama is pretty accurate. The exact same things happened. Young Yamaga played by Tsuyoshi Muro (left), and the real Yamaga (right), from Blue Blazes . So you were the guy who didn't know anything about anime or science fiction? Oh yeah, I was that character. During that time when I went to a production studio and saw people doing the anime I was like, "oh dang, a real person is doing it!" You actually show up in a cameo in episode 7. What was that like? Actually I didn't want to be in the show, but I was pretty much pressured to do it. I really didn’t want to. The scene where the young Yamaga passes out at the restaurant is really funny! That actually happened. When I was acting as the restaurant owner and running toward the fallen person I was reminiscing that it was me there. So it was a strange thing from the other person's perspective. You and your generation were responsible for arguably two of the biggest paradigm shifts in the anime industry, with the otaku boom in the mid-'80s and Evangelion in the mid-'90s. In 2017 do you see any similar groups of young people having that kind of influence? In that generation, when we started Gainax, anime and otaku culture wasn't there. But now there's a lot of anime. Otaku culture is so big, and the people coming into the genre are coming from anime otaku culture. It's already there. For us we were looking because it wasn't there. Now it's there so it's hard for people to make a different kind of anime. That sounds a little pessimistic, like anime doesn't have any room to grow. That old generation is still alive, so they might be able to make something. Maybe if they die off, like Miyazaki, Tomino, or others, maybe then the next generation can think of something new. Well they've got Shinkai and Your Name . Shinkai is the same old generation! For the answer we have to wait for all the good old guys to die off for the new ones to do something. In our generation, whatever we made was literally only a little part of Japan, just a speck in the world. But now it's grown so big. We were able to do whatever, and we made it how it is right now, with so much popularity and exposure. So it's really hard to see how the new generation can maneuver from there unless the old one dies. For instance, when we were making Evangelion , in the scene where Asuka first came out, she started speaking German, but it’s pretty much gibberish German. We did that because we never knew it would go all the way to Germany. When I go to German conventions I'm always asked, “Why is she talking gibberish? Why didn't you get a German-speaking person and get it right?” But I myself did not know it was going to be big. I thought it would only show in Japan. We said, "That'll be fine; everyone in Japan will think it's German." You mentioned the old generation needing to die. Gainax is still here. You're still here. What does Gainax mean to you in 2017 and how is that different from what it meant in 1984? I don't really know per se, because during those old times we were just college students. But every five years I feel a slight difference in parts of it here and there. A lot of people come in and a lot of people leave. So pretty much we call Gainax a "school." What about the influence that Gainax can have on modern fans? Instead of working with old people and friends, I like bringing in new people. In animation, the characters stay young. But if you keep on using the same people to make it, the interior gets old. That's why I like getting new people in. That way the interior stays young. You talked about how people have "graduated" from Gainax, and I assume you're talking about people at studios like Khara and Trigger. I'm curious why those splits happened. Was it just sort of the right time for people to move on? There's a reason, yes. After Evangelion was done, Khara was made. After Gurren Lagann was done, Trigger was made. So that's the reason. Basically the staff sticking together? The new people make something big like Evangelion . Then they get old. They can eat by themselves now. So they go out and make their own company. And the younger generation will make something new. And then they can go eat by themselves. That's why it's called a "school." When they get popular they graduate. And when that happens I just say “OK.” Because they still want to work with us, but if they want to go, they can do it. There’s no restriction. I'd like to thank FanimeCon guest and press staff for coordinating and interpreting for the interview, and Mr. Yamaga for taking the time to speak with me.